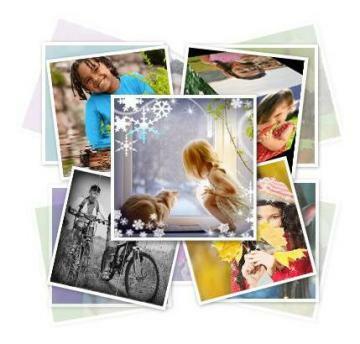 Pho.to offers a number of online services for photo editing, photo fun and sharing. They are convenient and fun to use and moreover everything is free. Makeup.Pho.to will make anybody look like a model in a glossy magazine! Remove skin imperfections, whiten teeth, fix red eye, add soft focus effect – all in one click! Want to enhance a picture in a single click? Improve any photo dramatically at Enhance.Pho.to in less than 10 seconds! Just upload a picture and see the service automatically apply color correction and sharpening, remove digital noise and fix red eye. Create fun photo effects and add cool photo frames online at Funny.Pho.to. There are more than 500 online photo effects, frames and templates. Choose from a variety of photorealistic effects, face montages, artistic photo filters, shape photo collages, celebrity montages and greeting photo cards with custom text! Face in hole effects use automatic face detection algorithm. You will also find animated effects and effects for multiple photos. Have unlimited fun with your photos at Cartoon.Pho.to! Convert a photo into cartoon or create an animated caricature from a face photo. Just upload a photo and make a face smile, wink or raise eyebrows with a single click! Besides face animations, there are ‘Freaky faces’ effects: turn your friend into an alien, bulb-head or a tough guy! Want to have your own unique avatar, that no one else has? Create it at Avatar.Pho.to! Just select one of the 70 fun effects and templates, upload your face photo, and get a cool animated or static avatar! Want to send a Birthday, Valentine, Christmas e-card or just share a fun greeting with someone? Cards.Pho.to lets you create personal animated flash e-cards for any special occasion or just to show you care. Just choose a card template, upload your photo and get a marvelous e-card with a ‘secret’. The recipient will have to click on a card to animate it until finally he or she sees the photo you’ve embedded into the card. Share.Pho.to lets you easily share an unlimited number of photos without going through the registration process! Upload multiple photos at once and get a short intuitive link starting with http://pho.to. Links of the kind give the recipient a clear clue about what exactly is being shared. Use quick buttons to share your photo set on Twitter and Facebook, or get embed codes and direct links to share images anywhere else.